There is a restaurant in Philadelphia called Dandelion that I love to visit when I’m in the city. It is like stepping into a pub in England. They have some really great dishes but one of my favorites is their roasted chicken. I mean this chicken is fall off the bone good. After many attempts to produce a tender fall off the bone chicken, I decided to use a technique that is similar to how I make roast beef. Well, this chicken is fall off the bone tender, juicy and delicious. This technique for roasting chicken can be used with root vegetables, gravy or marinade. I hope you get the chance to enjoy. Blend butter, olive oil, herbs, and salt & pepper together in a food processor. Rub herb mixture liberally under the chicken breast skin and all over the chicken. Place chicken in a roasting pan. Chop garlic and rub garlic on chicken breast. Roast chicken breast-side up at 425 degrees for 30 minutes. With a pair of tongs, turn chicken over, breast side down and cook for an additional 30 minutes at 350 degrees. Remove chicken from oven and flip chicken over or turn chicken breast side up again and cook an additional 30 minutes. After final 30 minutes, remove chicken from pan and rest for 15 minutes. Best chicken every time…. 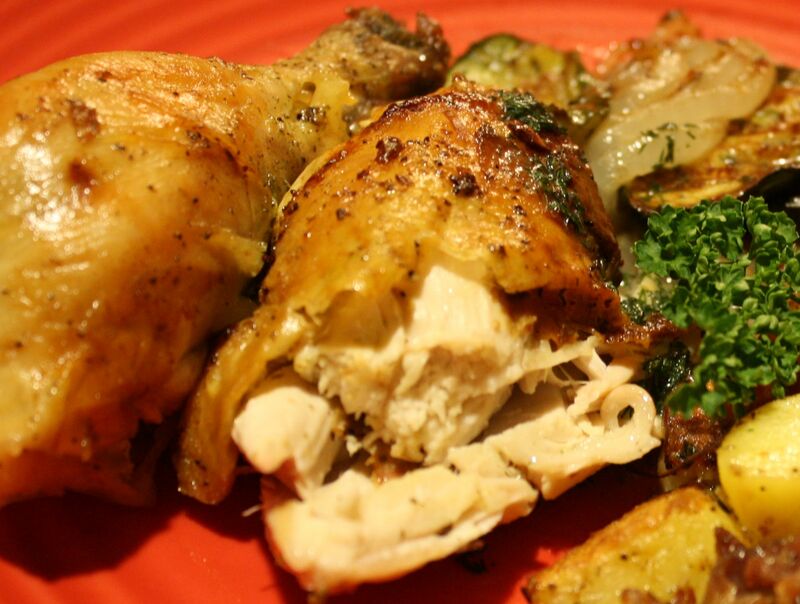 Great recipe and love the idea of lathering the chicken with a generous butter and herb blend! This chicken looks delicious! I love roasted chicken. That looks and sounds seriously yummy.